Former New York Senate leader Dean Skelos used his office to "strong arm" three businesses into giving his adult son $300,000 in fees and benefits in an extortion scheme that unraveled after investigators secretly recorded their phone calls, a prosecutor said Tuesday in closing arguments at the father and son's federal corruption trial. Skelos "violated the oath of office, committed federal crimes and did it in lockstep with Adam Skelos," said Assistant U.S. Attorney Rahul Mukhi told a Manhattan jury. The prosecutor cited evidence that Dean Skelos, while traveling to a funeral for a slain New York City police officer in January, confronted the Nassau County executive about money the county owed to a company that hired Adam Skelos as a consultant. The senator later called his 33-year-old son to tell him, "All claims that are in will be taken care of," using code language to try to cover his tracks, Mukhi said. The Long Island Republican used his "enormous public power for Adam Skelos' enormous gain" and "threats of legislative consequences to get Adam Skelos paid," Mukhi said. Opening statements began today in the corruption trial of former NewYork Senate Majority Leader Dean Skelos and his son. Ida Siegal reports. The companies — a major real estate developer, an environmental technology company and a medical malpractice insurer — "were strong-armed by Senator Skelos to pay Adam Skelos," he added. The prosecutor replayed some of the recordings, telling jurors they reveal a clear picture of "a conspiracy in real time." The defense has argued that the tapes and other evidence show only that Dean Skelos, 67, was looking out for his only child like any caring father, and that overzealous prosecutors are trying to criminalize the horse-trading that passes for normal in state politics. Their lawyers were to give their closing arguments on Wednesday. Last week, Anthony Bonomo, the chief executive of the insurance company, testified that after he hired Adam Skelos for a $78,000-a-year position in 2013, the son rarely reported for work. Skelos's former supervisor at the company had previously testified that the senator's son threatened to "smash" in his head after he questioned the son's work ethic. Bonomo also claimed he received a call from the senator complaining that the supervisor was "picking on" his son, and directing him to "just work this out." The witness said he felt he wasn't in a position to fire the son without risking upsetting a powerful lawmaker who could influence legislation related to his industry. 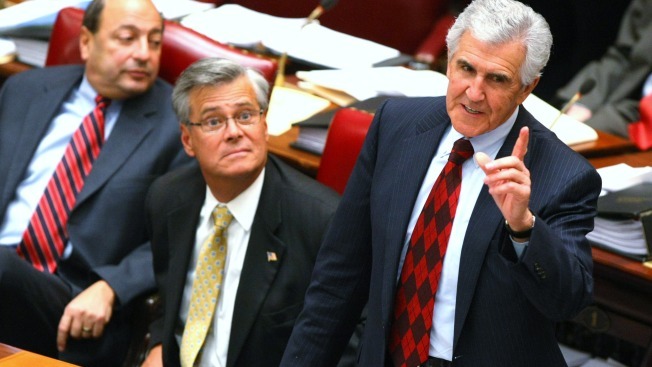 "I did not want to have a problem in Albany," Bonomo said. The trial is in its fourth week. Deliberations could begin as early as Wednesday afternoon. A separate trial in an adjoining courthouse ended last week with the conviction on bribery charges of former Assembly Speaker Sheldon Silver.